(Mental Floss) -- President Barack Obama turns 48 on Tuesday. While the first family encourages you to send contributions to your favorite charity in lieu of the White House, if you insist on doing some last-minute birthday shopping for 44, you might consider a pair of jeans or a case of Bud Light. For some historical precedent, here's a look back at some of the more interesting presidential gifts. 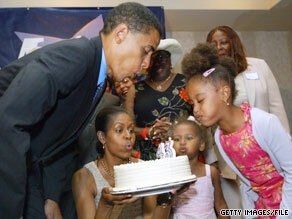 Future president Barack Obama and his family blow out the candles on his birthday cake in 2004. President Bush and his family received about 1,000 gifts per month during his two terms in office. Bush's haul included an iPod from U2 lead singer, Bono, "The Worst-Case Scenario Survival Handbook" and vocabulary-building game from the Sultan of Brunei, and an electric harp with a speakerphone from Vietnam. The most unusual gift Bush received may have been the 300 pounds of raw lamb meat from the president of Argentina in 2003. The lamb, like all gifts from overseas, was accepted by the Office of the President on behalf of the nation, and passed along to the General Services Administration. Most non-perishable gifts of state end up in presidential libraries or the National Archives. We'll say this for President Heydar Aliyev's gift to President Clinton: It was unique. The president of Azerbaijan wanted his gift to be representative of Azerbaijani craftsmanship, so he called upon Kamil Aliyev, a renowned carpet portrait artist. Kamil Aliyev's design featured the first couple inside a heart-shaped medallion, the first double portrait he ever attempted. "I wanted to convey their lives as one beating heart," he said. While Aliyev designed the carpet and dyed the yarn, 12 young women were employed to help complete the portrait in 10 weeks. Heydar Aliyev presented the carpet to the Clintons in August 1997. President Reagan, who was gifted 372 belt buckles while in office, also received enough tacking equipment during his time in Washington to outfit an entire stable. Mental Floss: How does scratch-and-sniff work? Mexican President Jose Lopez Portillo commissioned Octavio Ocampo to paint a portrait of President Carter in Ocampo's trademark metamorphic style, which juxtaposes various images within a larger image to create an optical illusion. Carter's image in the portrait is created out of national symbols, including buildings, flags, sailing ships, and truck convoys. Portillo presented the portrait to Carter in 1979. A Pakistani man's gift to President Nixon required an unusual accessory to fully appreciate. S. Nabi Ahmed Rizvi provided a magnifying glass inside a plush blue velvet box, along with two snapshots of himself and two grains of rice. One grain of rice featured a portrait of Nixon as president; the other featured a portrait of a young Nixon in the Navy. The gift was displayed as part of the National Portrait Gallery's "To the President: Folk Portraits by the People" exhibit. What better way to show your president you admire him than by carving his likeness into a peach pit? R.J. McErlean's remarkable ode to JFK features a portrait of Kennedy and the inscription "President John F. Kennedy of the United States." An eagle on a shield is carved on the left side of the pit, above a depiction of Saint Christopher. A two-lane bowling alley was installed in the White House in 1947 as a birthday gift to President Truman. No matter that he hadn't bowled since he was 19, Truman knocked down seven pins on the first roll at the alley, which was paid for by donors from Truman's home state of Missouri and moved to the Old Executive Office Building in 1955. The birthday cake presented to FDR on the occasion of his 59th birthday was 5 feet high and weighed 300 pounds. The cake was a gift of the Bakery and Confectionary Workers International Union of America. Along with the cake, the union donated $500 to FDR's "Fight Infantile-Paralysis" campaign. When life gives you lemons, make pigs. A lemon carved to look like a pig was presented to President Hayes and later featured in an exhibit at the Herbert Hoover presidential library titled, "Weird and Wonderful: Gifts Fit For a President." Museum director Richard N. Smith said at the time, "It looks a little like you'd expect a 110-year-old lemon to look." While she may or may not have been the inspiration for the bizarre gift, Hayes' wife, Lucy, was nicknamed "Lemonade Lucy" because she banned alcoholic beverages at state functions. While he donated most of the wine and liquor he received to military hospitals, President Lincoln made good use of many of the other gifts showered upon him throughout his presidency. He was inaugurated in a suit donated by Titsworth and Brothers of Chicago, and, according to Lincoln scholar Harold Holzer, is reported to have told his wife, "There is one thing to come out of this scrape anyhow. We are going to have some new clothes!" One of the earliest recorded gifts of state was the mammoth cheese presented to President Jefferson by the Republican Baptists in Cheshire, Massachusetts, in 1802. To celebrate Jefferson's election, town elder John Leland inspired his Baptist congregation to manufacture a 1,235-pound cheese to give to the president. In 1880, Congress created "Washington's Birthday," the first federal holiday to honor an American-born citizen. The holiday was celebrated on February 22 until 1968, when Congress moved it from its fixed day to the third Monday in February as part of the Uniform Monday Holidays Act.